Floating minnow 77mm 10.5g Color:GG Chart Bass. Floating minnow 100mm 1/2OZ Color: Champagne Kinkuro. Floating crankbait 58mm 10g Color: GP Pro Blue. Suspending minnow 95mm 11g Color: YMC. Suspending minnow 95mm 11g Color: IL Ito Illusion. Floating minnow 77mm 10.5g Color: PM Funa. Floating crankbait 58mm 10g Color: Frozen Tequila. Suspending minnow 95mm 11g Color: Aka Tora. Floating minnow 77mm 10.5g Color: PM Higai. 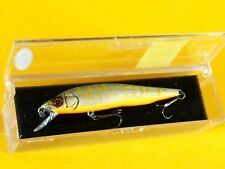 Floating crankbait 58mm 10g Color: Aka Tora. Suspending longbill minnow 90.5mm 12.6g Color: Ghost Silver Wakasagi. Floating minnow 77mm 10.5g Color: Crown. Suspending longbill minnow 90.5mm 12.6g Color: Table Rock SP. Floating minnow 77mm 10.5g Color: Gill. Suspending longbill minnow 90.5mm 12.6g Color: SG Kasumi Reaction.